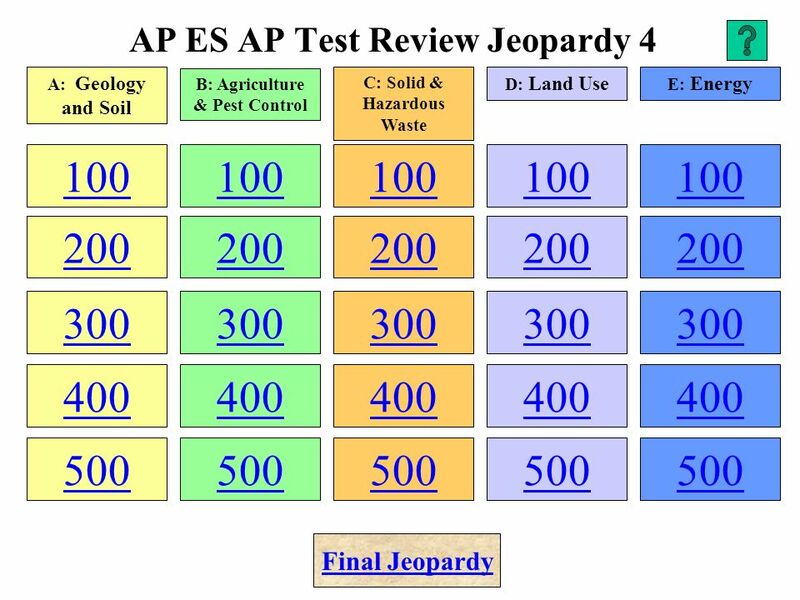 AP ES AP Test Review Jeopardy 4 100 200 300 400 500 100 200 300 400 500 100 200 300 400 500 100 200 300 400 500 100 200 300 400 500 A: Geology and Soil. 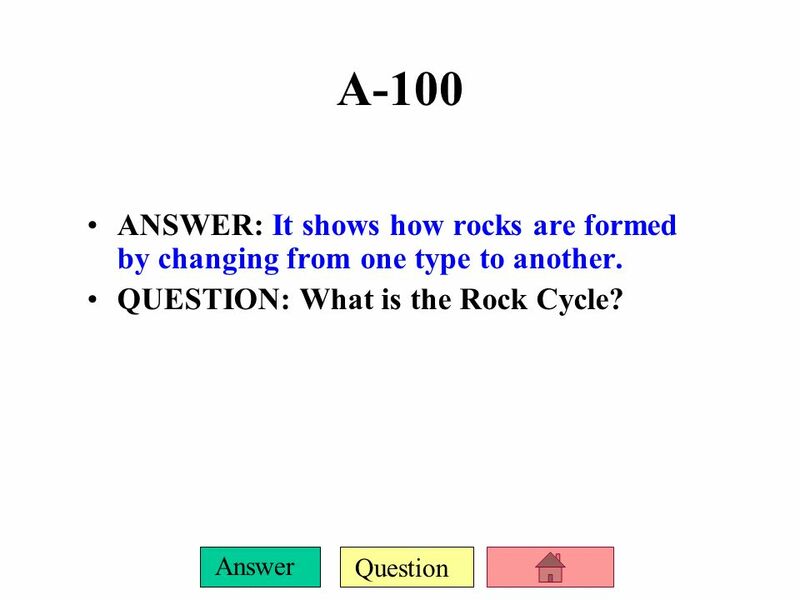 4 Question Answer A-100 ANSWER: It shows how rocks are formed by changing from one type to another. QUESTION: What is the Rock Cycle? 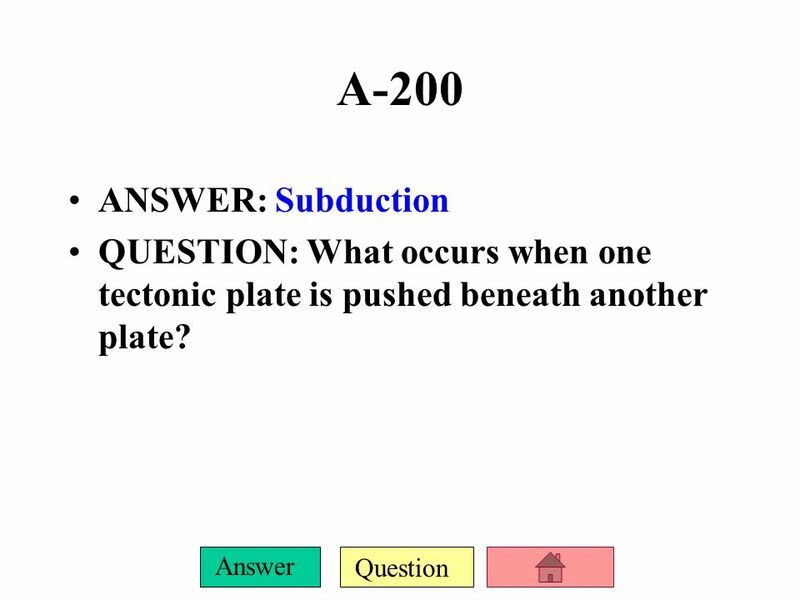 5 Question Answer A-200 ANSWER: Subduction QUESTION: What occurs when one tectonic plate is pushed beneath another plate? 6 Question Answer A-300 ANSWER: The 2 major methods of mining minerals. QUESTION: What are strip or open pit and underground mining? 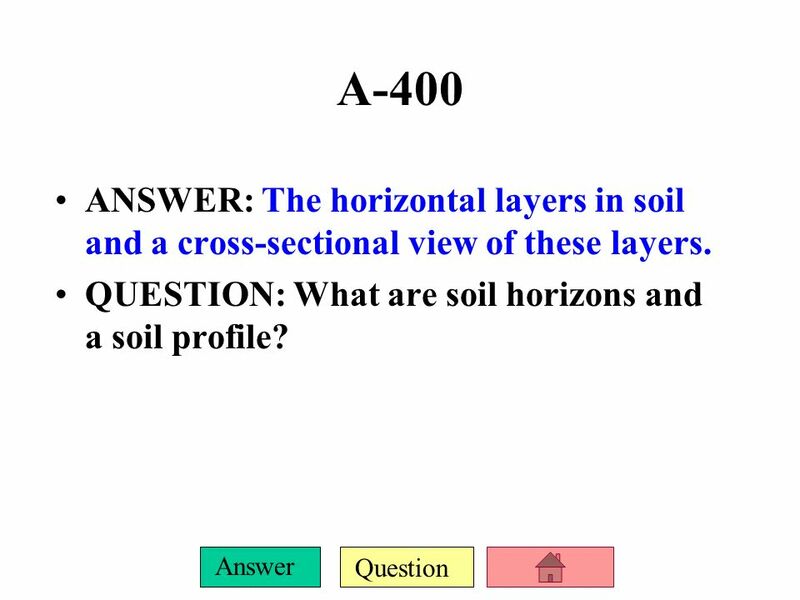 7 Question Answer A-400 ANSWER: The horizontal layers in soil and a cross-sectional view of these layers. QUESTION: What are soil horizons and a soil profile? 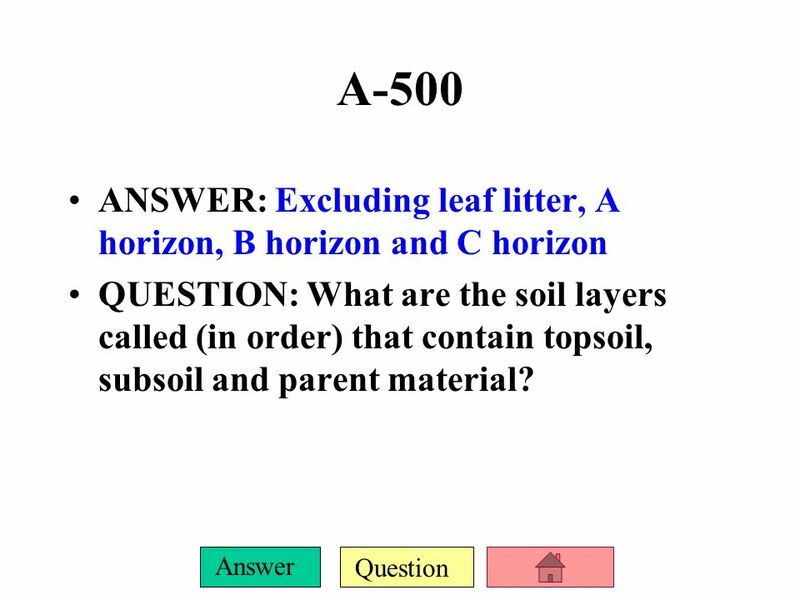 8 Question Answer A-500 ANSWER: Excluding leaf litter, A horizon, B horizon and C horizon QUESTION: What are the soil layers called (in order) that contain topsoil, subsoil and parent material? 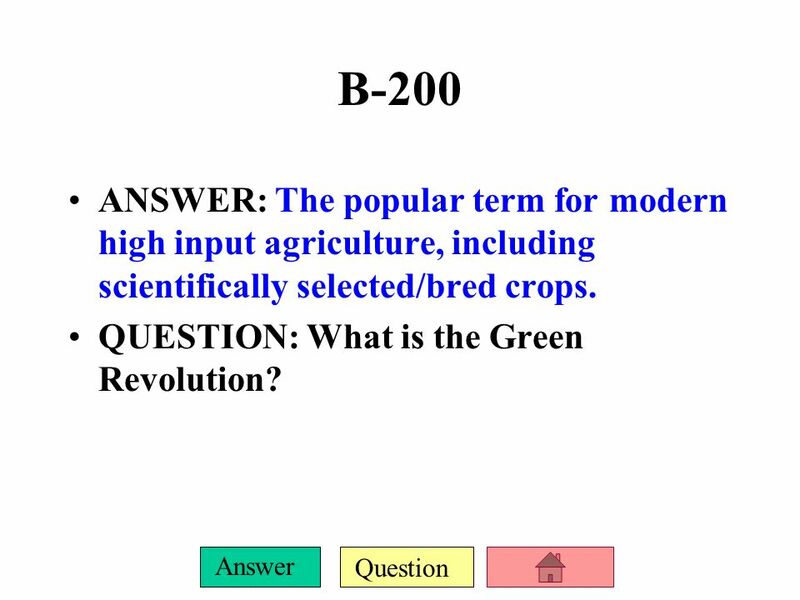 10 Question Answer B-200 ANSWER: The popular term for modern high input agriculture, including scientifically selected/bred crops. QUESTION: What is the Green Revolution? 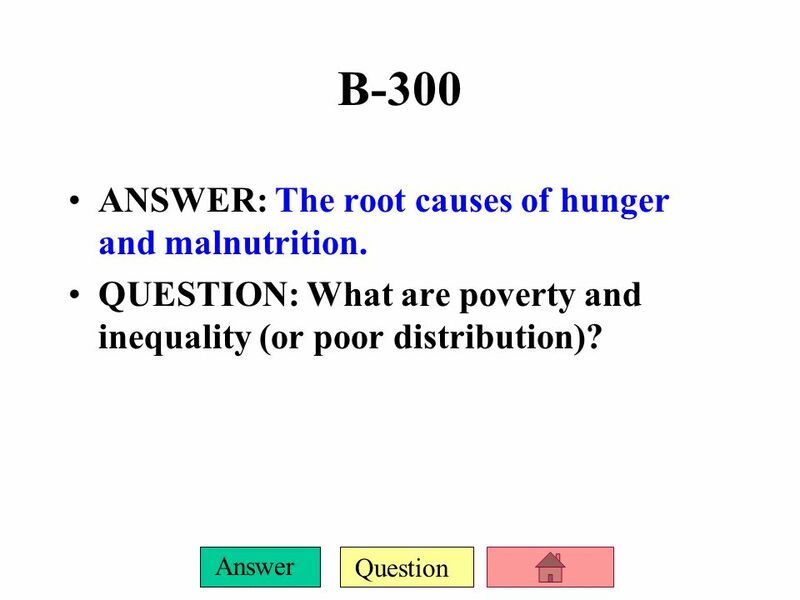 11 Question Answer B-300 ANSWER: The root causes of hunger and malnutrition. QUESTION: What are poverty and inequality (or poor distribution)? 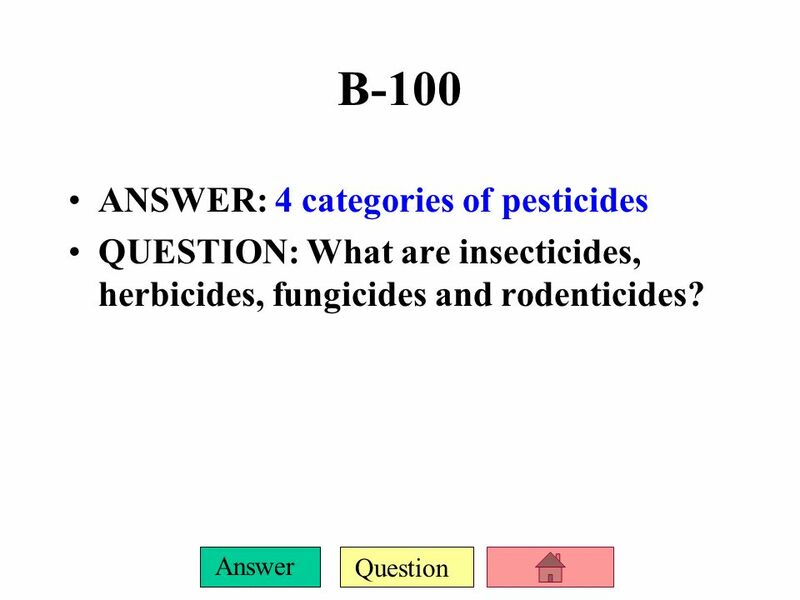 12 Question Answer B-400 ANSWER: A pest control system that uses pesticides along with cultural and biological strategies. 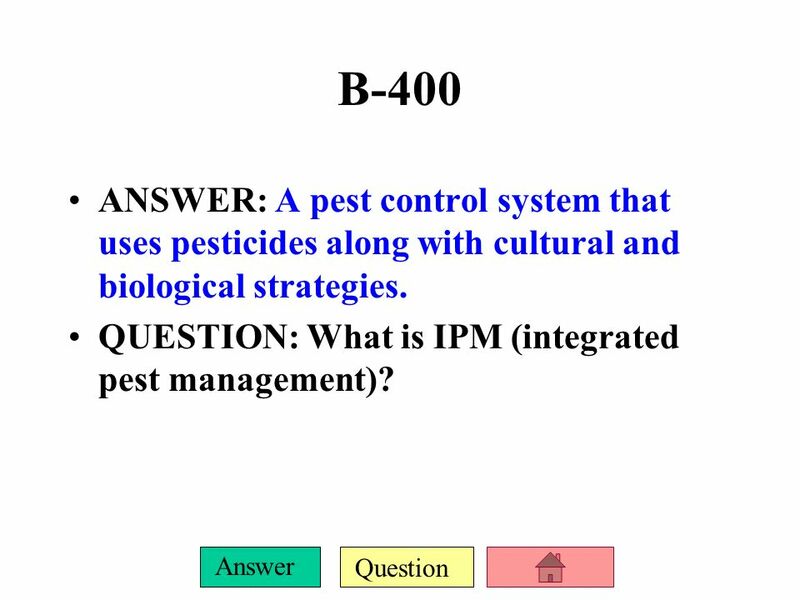 QUESTION: What is IPM (integrated pest management)? 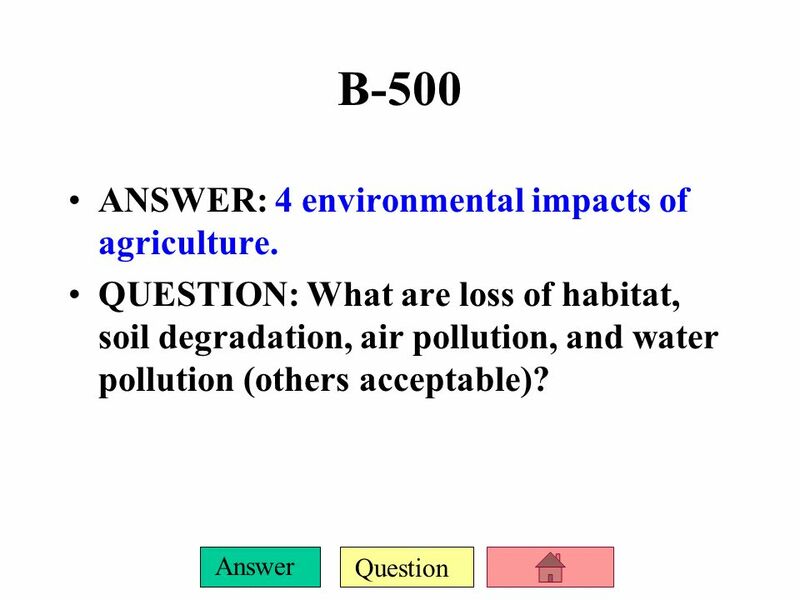 13 Question Answer B-500 ANSWER: 4 environmental impacts of agriculture. QUESTION: What are loss of habitat, soil degradation, air pollution, and water pollution (others acceptable)? 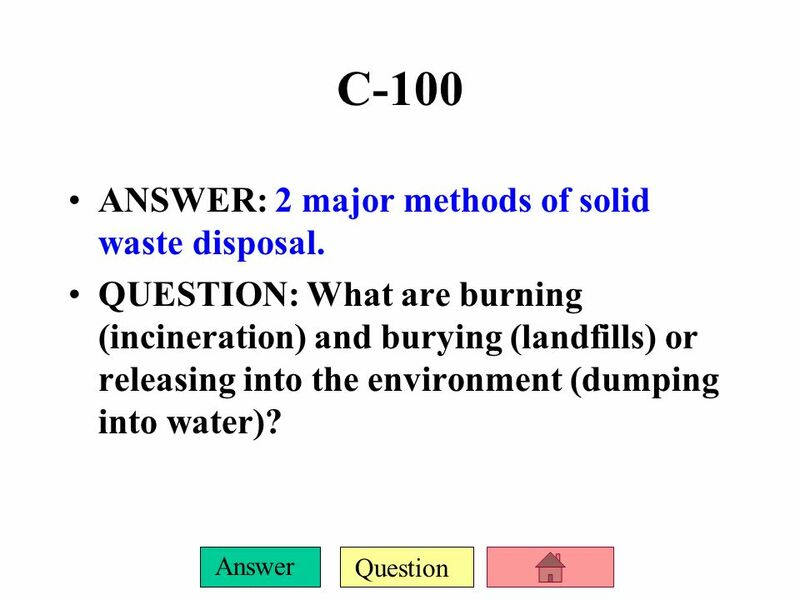 14 Question Answer C-100 ANSWER: 2 major methods of solid waste disposal. QUESTION: What are burning (incineration) and burying (landfills) or releasing into the environment (dumping into water)? 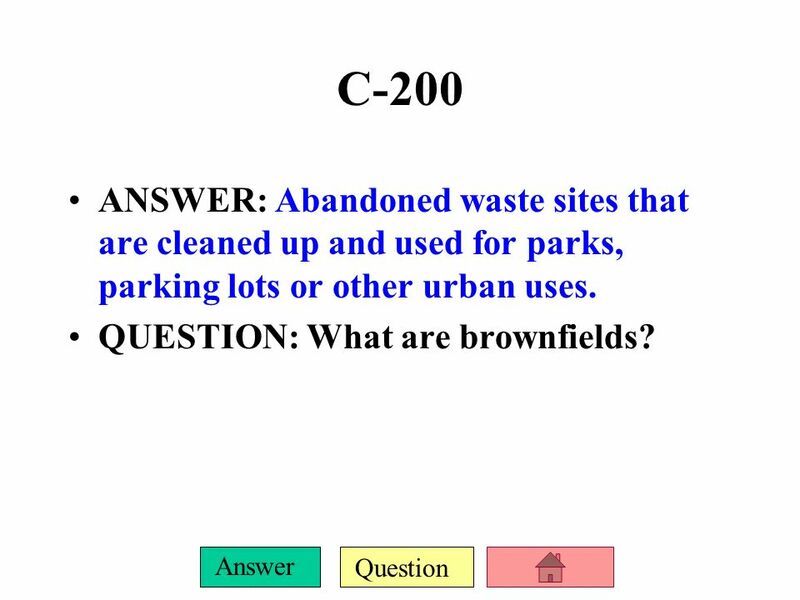 15 Question Answer C-200 ANSWER: Abandoned waste sites that are cleaned up and used for parks, parking lots or other urban uses. QUESTION: What are brownfields? 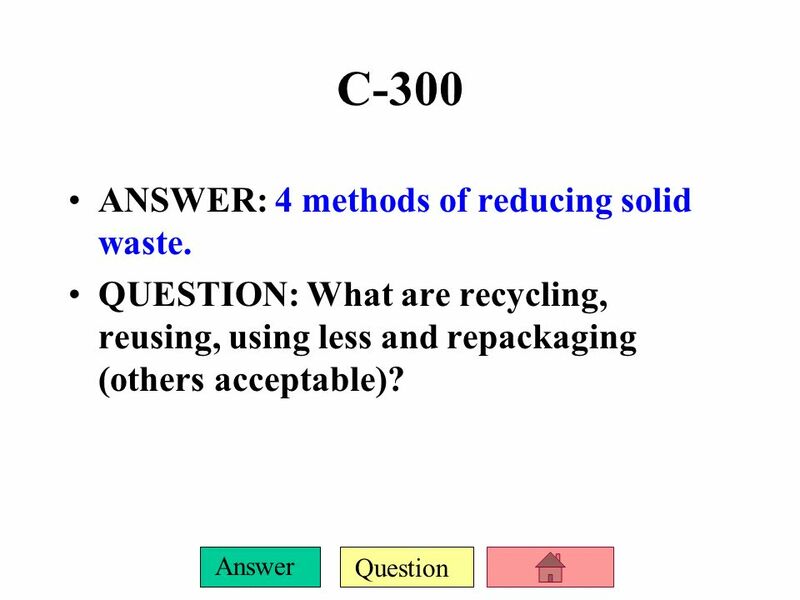 16 Question Answer C-300 ANSWER: 4 methods of reducing solid waste. QUESTION: What are recycling, reusing, using less and repackaging (others acceptable)? 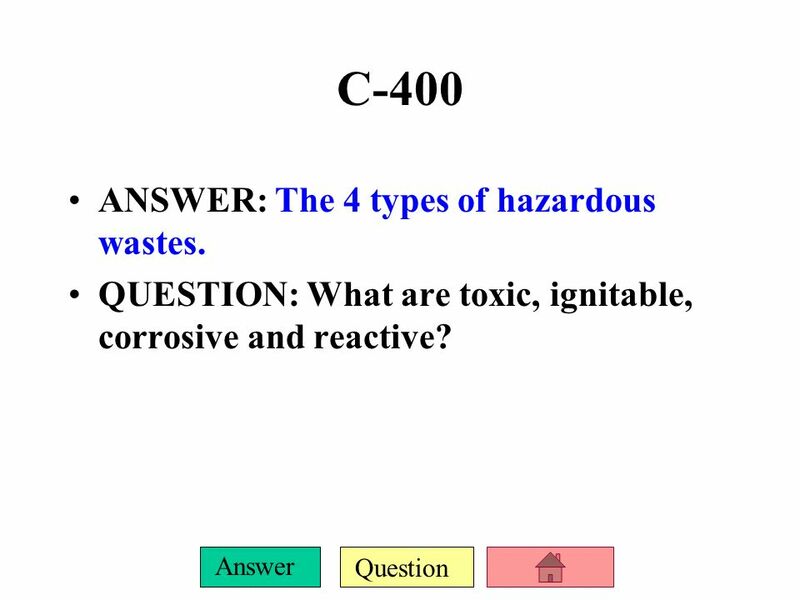 17 Question Answer C-400 ANSWER: The 4 types of hazardous wastes. QUESTION: What are toxic, ignitable, corrosive and reactive? 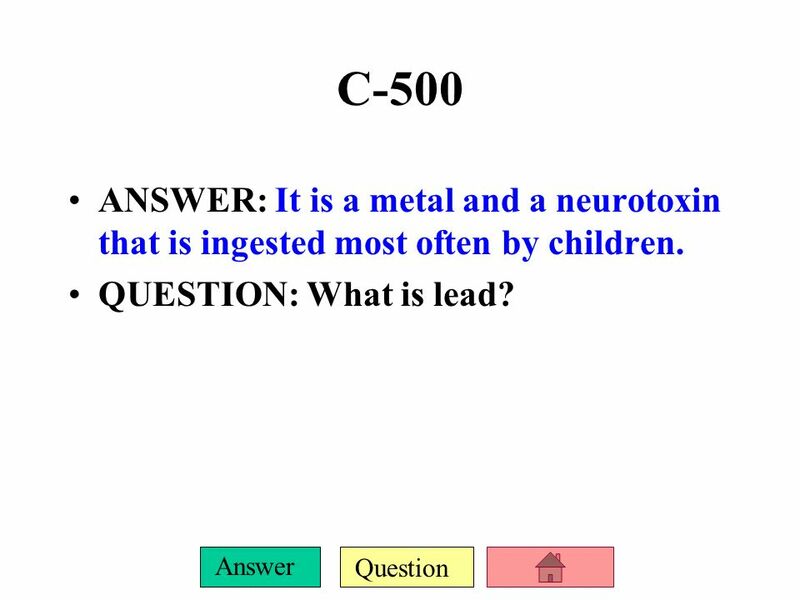 18 Question Answer C-500 ANSWER: It is a metal and a neurotoxin that is ingested most often by children. QUESTION: What is lead? 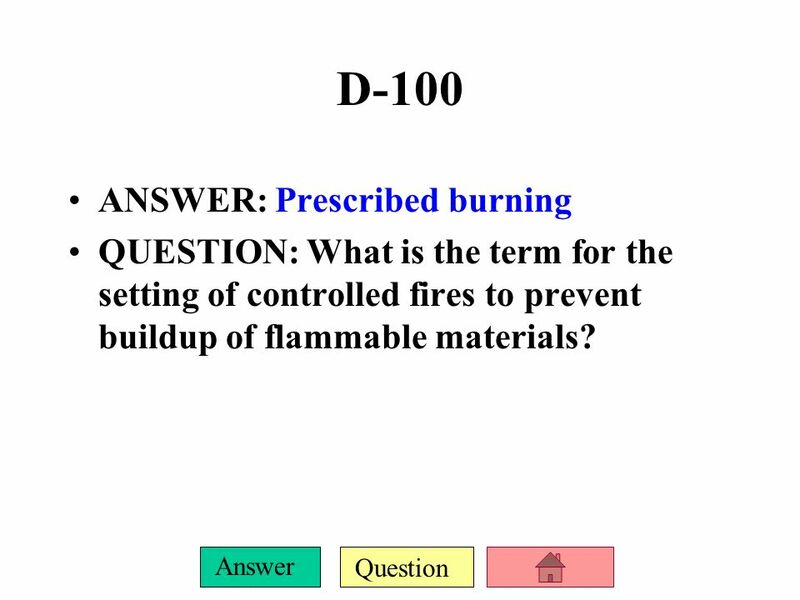 19 Question Answer D-100 ANSWER: Prescribed burning QUESTION: What is the term for the setting of controlled fires to prevent buildup of flammable materials? 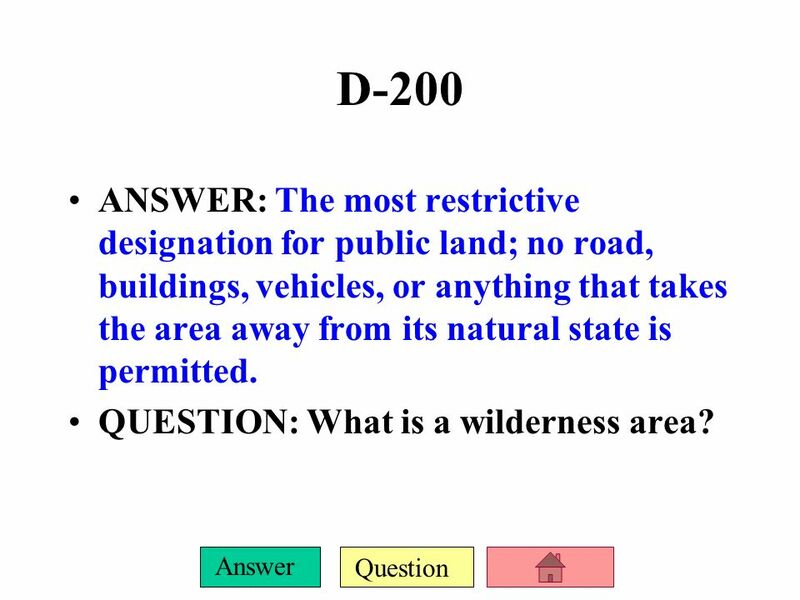 20 Question Answer D-200 ANSWER: The most restrictive designation for public land; no road, buildings, vehicles, or anything that takes the area away from its natural state is permitted. QUESTION: What is a wilderness area? 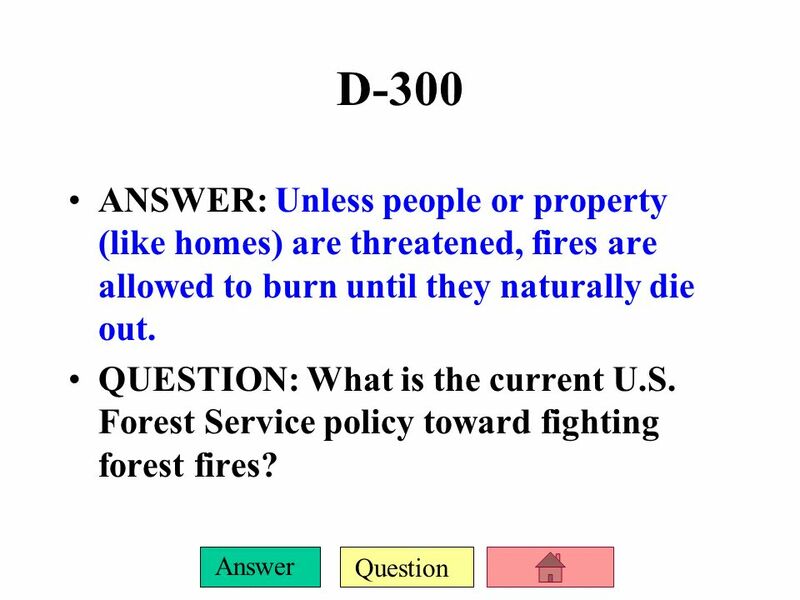 21 Question Answer D-300 ANSWER: Unless people or property (like homes) are threatened, fires are allowed to burn until they naturally die out. QUESTION: What is the current U.S. Forest Service policy toward fighting forest fires? 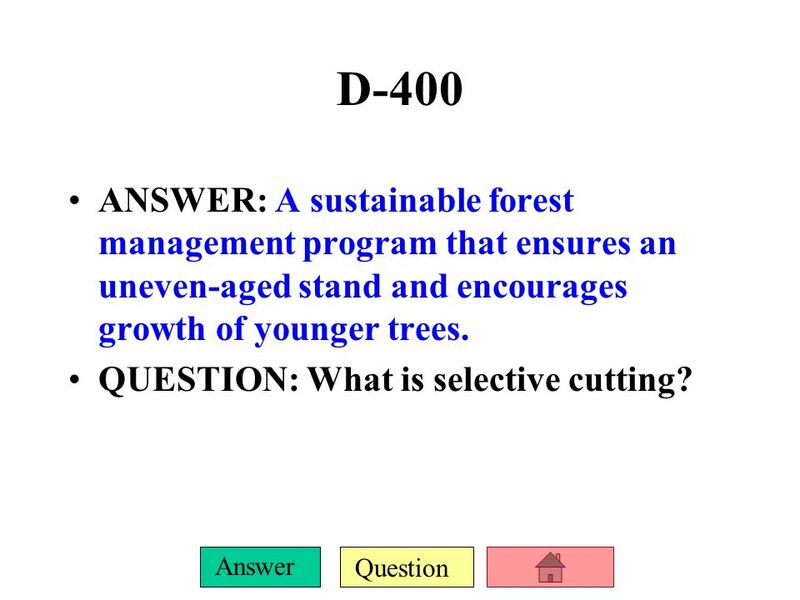 22 Question Answer D-400 ANSWER: A sustainable forest management program that ensures an uneven-aged stand and encourages growth of younger trees. QUESTION: What is selective cutting? 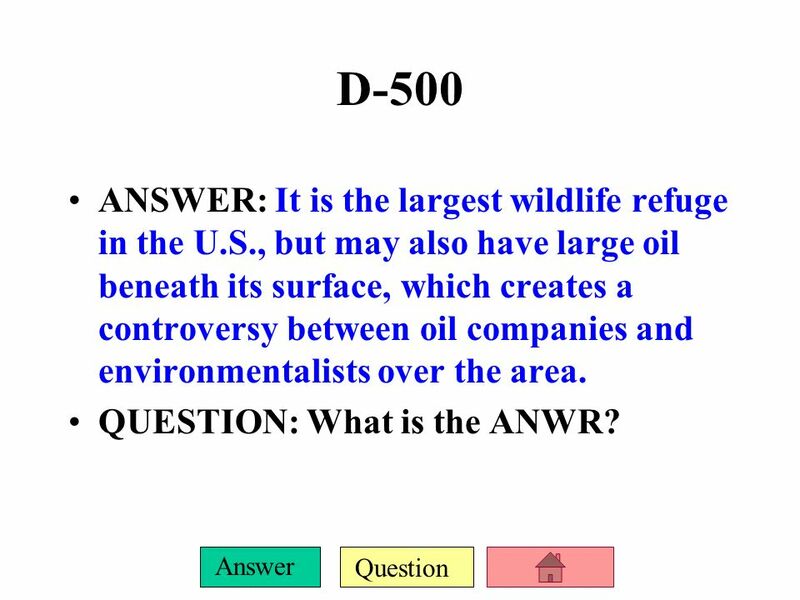 23 Question Answer D-500 ANSWER: It is the largest wildlife refuge in the U.S., but may also have large oil beneath its surface, which creates a controversy between oil companies and environmentalists over the area. QUESTION: What is the ANWR? 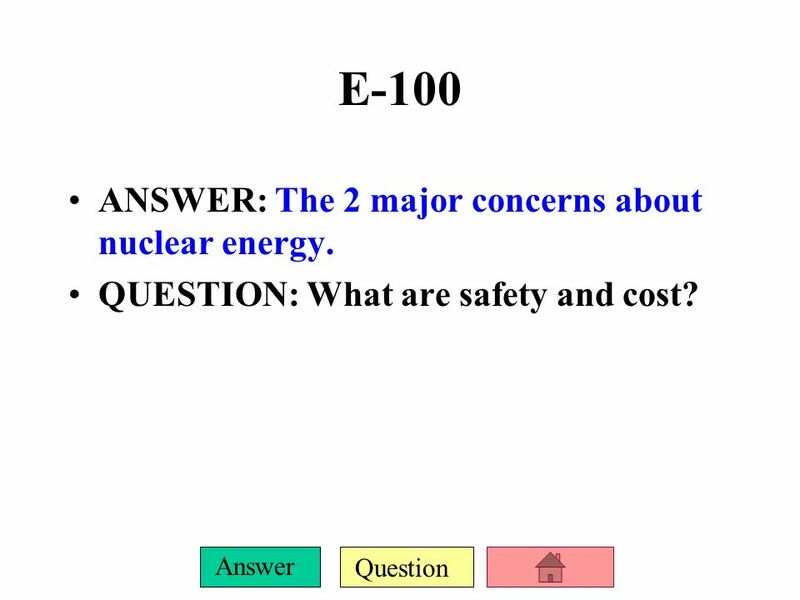 24 Question Answer E-100 ANSWER: The 2 major concerns about nuclear energy. QUESTION: What are safety and cost? 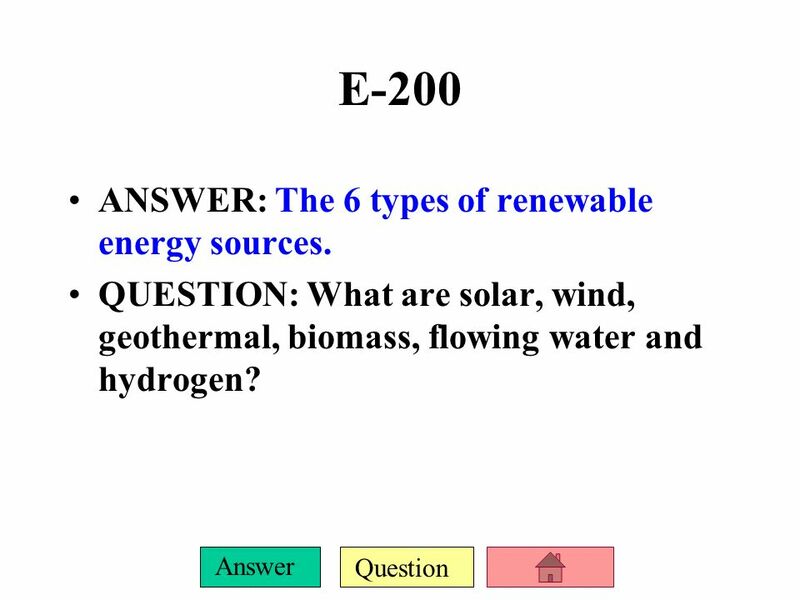 25 Question Answer E-200 ANSWER: The 6 types of renewable energy sources. QUESTION: What are solar, wind, geothermal, biomass, flowing water and hydrogen? 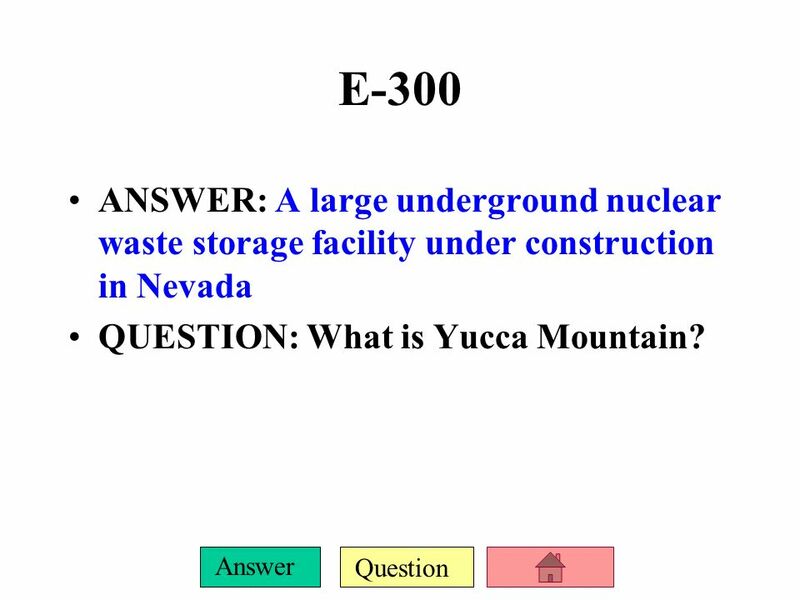 26 Question Answer E-300 ANSWER: A large underground nuclear waste storage facility under construction in Nevada QUESTION: What is Yucca Mountain? 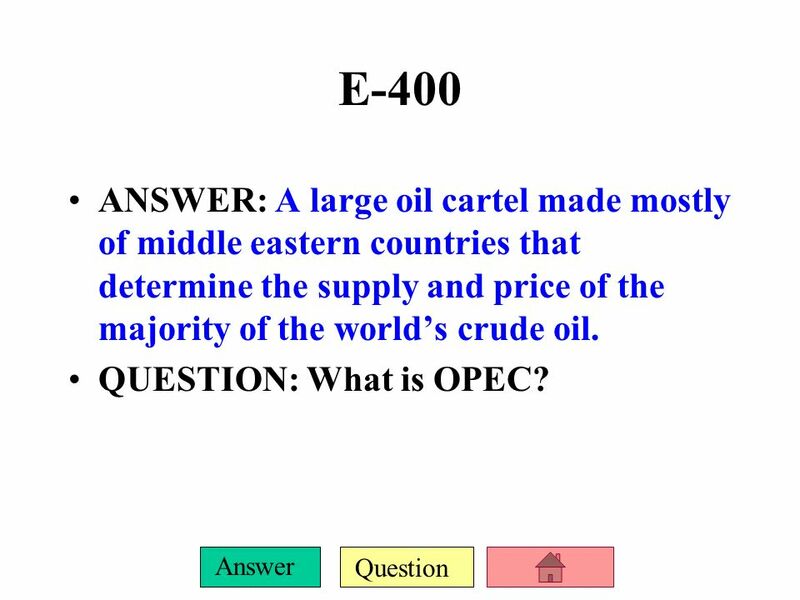 27 Question Answer E-400 ANSWER: A large oil cartel made mostly of middle eastern countries that determine the supply and price of the majority of the worlds crude oil. QUESTION: What is OPEC? 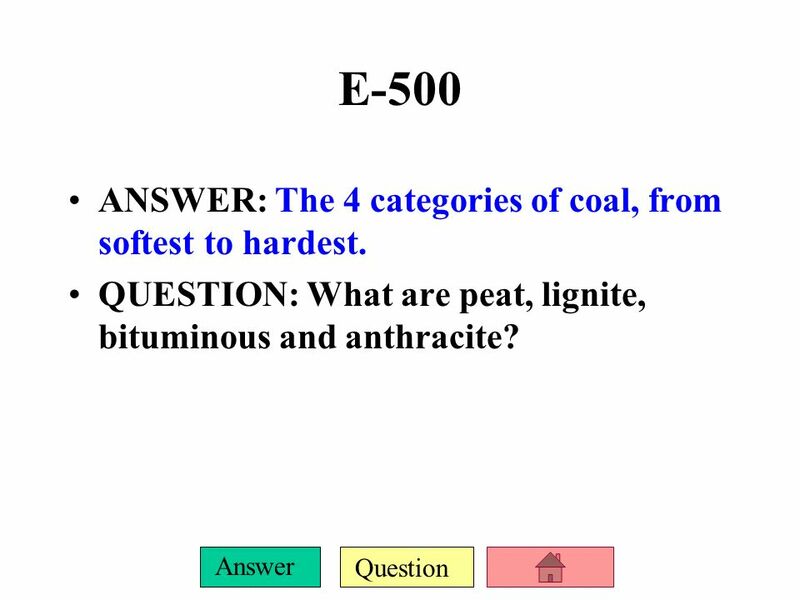 28 Question Answer E-500 ANSWER: The 4 categories of coal, from softest to hardest. QUESTION: What are peat, lignite, bituminous and anthracite? 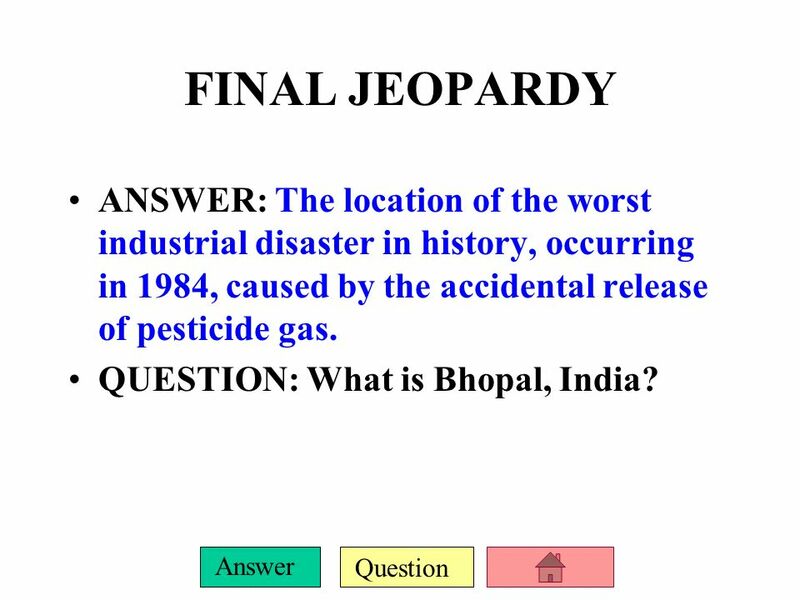 29 Question Answer FINAL JEOPARDY ANSWER: The location of the worst industrial disaster in history, occurring in 1984, caused by the accidental release of pesticide gas. QUESTION: What is Bhopal, India? 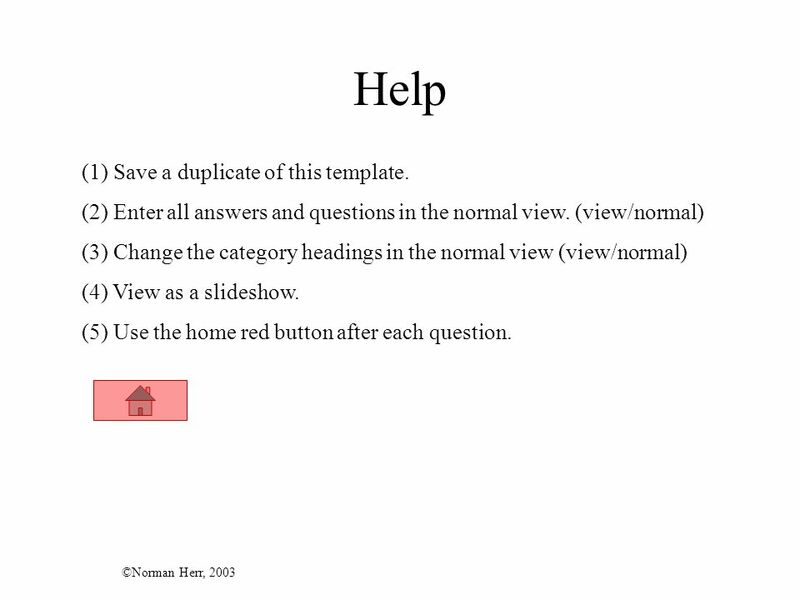 Download ppt "AP ES AP Test Review Jeopardy 4 100 200 300 400 500 100 200 300 400 500 100 200 300 400 500 100 200 300 400 500 100 200 300 400 500 A: Geology and Soil." The Staple of the Industrial Revolution. Lignite Coal: also known as brown coal, is a sedimentary rock and consists of about percent carbon Bituminous. Chapter 9 The Urban World. Population and Urbanization Jobs define urban vs. rural, not populations. Chapter 18: Part #1 Oil Fossil Fuels and the Environment. Chapter 4 continued Nonrenewable Mineral Resources Energy Energy Options Environmental Degradation Environmental Equity and Sustainable Development. SUSTAINING THE EARTH MILLER/SPOOLMAN 10 TH Resources – natural capital.